In the deeply rural Zithulele community, based in one of the poorest districts in South Africa, the clinical and HIV programme staff believe that despite our resource-poor, rural setting, our patients deserve the same quality of medical care as their compatriots elsewhere. As a result, the HIV service that we have developed over the past seven years has had a strategic emphasis on providing accessible, quality care delivered in an innovative way that addresses local challenges and builds a robust foundation for future growth and sustainability. While our challenges are not unique, rural health facilities are often fragile entities. They have low staff numbers, yet carry a relatively heavy responsibility. In these parts, there is no plan B unless you devise it yourself! Fragile clinics: There is high staff turnover, significant problems with procurement, an isolated work environment and lack of on-site clinical and systematic support. While staff receive training in clinical and policy implementation, this is often rote learning and ongoing mentorship is essential to bring depth of understanding. Zithulele staff provide strong links between the clinics and hospital, improving access to expertise and morale among clinic nurses. Mobile patients: Our large, still-growing number of patients are extremely mobile, with a lot of patient movement both between facilities within the programme borders, but also in and out of the geographical area due to migrant labour. A uniform system that works effectively across all sites and that is easy for patients to access from any programme facility has been critical to avoid confusion and to ensure continuity of care. Drug supply: In common with many other areas, our primary healthcare facilities have struggled to maintain continuous access to medication and other stock items. (Everything from paracetamol to antibiotics to ART for the prevention of mother-to-child transmission (PMTCT), as well as needles, HIV test kits and more, has been out of stock at some point over the years.) Not only is our district hospital committed to supporting primary healthcare, it is a resource-efficient and economically viable approach to link hospital and clinic care in order to prevent more complicated, expensive care at hospital level due to stock-outs at clinic level. Preventing resistance in a context where drug regimens are limited and advanced treatment regimens may be difficult or impossible to access is critically important, both from a programmatic and individual patient perspective. More information on how we do this is included in the model presented below. In light of these issues, we realised early on that while our programme requires an element of flexibility to meet the needs of a rural community, it also needs: to ensure that high quality, comprehensive care is accessible to all; to be stringent enough to promote adherence to lifelong treatment; and to provide an effective method of monitoring patients. We are privileged to have had access to resources that made it possible to avoid compromise on any of these aspects. Operating within a public sector context has also meant that any model that we implemented needed to meet national priorities and be flexible enough to adapt as these priorities change over time. No patient in the programme has ever been turned away without their full regimen of treatment - a momentous achievement in a district and province where ARV stock-outs have made regular headline news. The government has focused on expanding programmes across the country, with energy and resources being directed towards ensuring access for all who need treatment. However, given the challenges outlined above and in line with our philosophy that rural care should not be second rate, we have emphasised the need for accessibility to quality care. 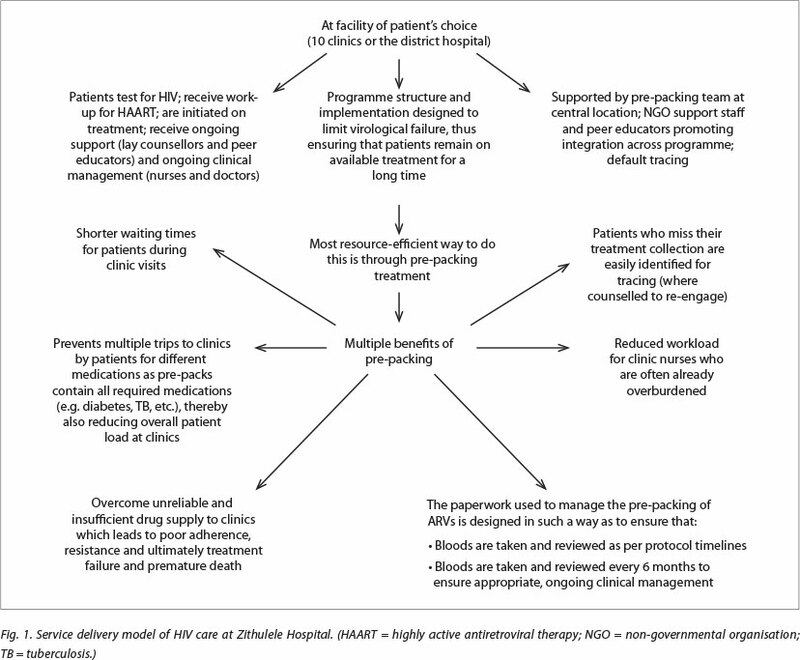 The way we have designed and structured our programme, particularly our adoption of pre-packing medication from as soon as we started to provide decentralised, clinic-based care, has not always been well understood or received by middle managers who occasionally misinterpreted national policy as a one-size-fits-all directive. Nevertheless, the outcomes that have been achieved demonstrate that the long hours spent negotiating have been worthwhile. As far as possible, we work within the existing structure and resources of the Eastern Cape Department of Health (ECDoH), but implementing the above programme does require some additional funding. Non-governmental organisation (NGO) support has made this possible, and in the current budgetary climate, continued NGO support remains essential to maintain this model. However, with the attention we are giving to strengthening and supporting the ECDoH systems and structures, and with an imminent expansion of government-funded prepacking, it is hoped that over time we will be able to maintain this standard of care without outside support. Acknowledgements. Our thanks to the many staff who have worked with us over the years to design and implement this programme, including Drs Karl and Sally le Roux, Dr Taryn Gaunt, Dr Liz Gatley, Ms Monique Lines, staff of the Donald Woods Foundation and the Jabulani Rural Health Foundation. We also thank Cell-life who developed the iDART programme and the Vodacom Foundation who donated hardware and training.